It may be hard to imagine a time when the term “organic” was completely unregulated or when farmers markets were not a common sight in most major cities, but this was the agricultural landscape that Jerry and Jean Thomas drove boldly into when they left Los Angeles in their VW bug with a dream to farm. 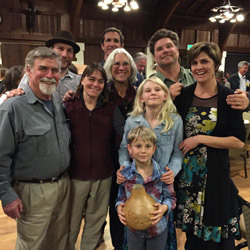 This January, the Ecological Farming Association honored Jerry and Jean of Thomas Farm with a Stewards of Sustainable Agriculture (“Sustie”) Award, which has previously been bestowed upon such pioneers as Will Allen, Vandana Shiva, Wes Jackson, and numerous Ferry Plaza farmers. This year, the Association also recognized Congressman Sam Farr, a fierce political ally for small and organic growers; master gardener Wendy Krupnik; and farmer Michael O’Gorman, who founded the Farmer Veteran Coalition. “We were both city folks from Los Angeles who just decided not to fight the traffic anymore,” recalls Jean. In 1970, the couple ventured north in search of a simpler way of life. They settled in Corralitos, just east of Santa Cruz, where they found a house on five acres that they were able to lease for just $90 a month. The property included dry-farmed heritage apple orchards, and the Thomases soon added tomatoes, squash, and flowers, which they grew without pesticides or fertilizers. Jerry had grown up learning to garden from his mother, who had learned from her mother. He read Rodale’s Encyclopedia of Organic Gardening and old agricultural extension pamphlets to deepen his knowledge of farming. In 1971, Rodale started the nation’s first organic certification program, but the publisher soon realized the project was beyond their capacity. In 1973, 54 California farmers, including the Thomases, decided to found their own certification system, California Certified Organic Farmers (CCOF). The farmers set the standards for CCOF’s organic label, and they inspected and certified each other. Thomas Farm later became one of the founding members of CCOF’s first regional chapter on the Central Coast. CCOF’s standards informed the creation of USDA’s National Organic Program (NOP), established in 2000. Today CCOF is the largest NOP organic certifier, with more than 2,300 certified farmers and food businesses. In the late 1970s, the Thomases were instrumental in establishing farmers markets on the Central Coast at a time when farmers markets were a political battleground, opposed by powerful groups like the Farm Bureau. “There was a lot of opposition to the first farmers market here. We couldn’t even find a location for it,” says Jerry. 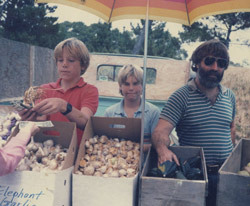 In June 1977, shortly after the first Direct Marketing Act in California was passed, Jerry and CCOF founder Barney Bricmont started the first farmers market in Santa Cruz County at a local elementary school. The market later moved to Cabrillo College in Aptos, becoming the flagship market of Monterey Bay Certified Farmers Markets. Years later, after the 1989 Loma Prieta Earthquake, Jerry helped found the Santa Cruz Community Farmers Market. Thomas Farm was also a leader in establishing a market for organic cut flowers, new territory for organic growers. Although many customers are primarily concerned with pesticides on food, the cut flower industry imposes a heavy chemical burden on the planet. “Pesticide residue regulations for conventional flowers are not as stringent as those for food, so there’s no telling what’s on them,” says Jerry. The farm became known for their diversity of pesticide-free dahlias, tulips, sunflowers, and other specialty cut flowers. In 2004, Jerry and Jean decided to retire, and their son, Josh, and his wife, Kari, stepped in to manage the farm. Josh had been working in construction and Kari in medical billing, and the highlight of their week was doing farmers markets on the weekends. Still, taking the leap to full-time farming was a hard decision for Josh. “I didn’t really want to do it, until my feet were to the fire,” he admits. “My dad said, ‘If you don’t want to take it over, it’s just going to perish.’” Kari helped convince him that there was a huge opportunity in taking over the viable business that his parents had established. 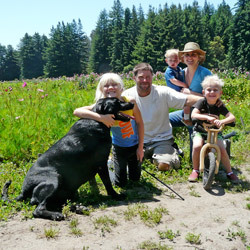 Josh and Kari diversified and expanded the farm from seven acres to 44, experimenting with other crops and flowers. But three years into a drought that has no end in sight, they are currently seeking to downsize to a smaller parcel of land and plant perennial flowers that require less irrigation. After a decade of growth, they feel that they’ve reached a plateau of what’s sustainable for them, as both farmers and the parents of four children. After 40 years, the Thomases continue to give back to their community in ways that extend beyond just food. Jean is an artist who displays her paintings in galleries and opens up the farm for wreath-making classes. The Thomases have been mentors for new organic farmers at Lonely Mountain Farm and High Ground Organics. They remain committed to employing their workers year round, paying a livable wage, and ensuring a safe work environment free from toxic pesticides. “It’s one thing for people to be farmers, but to have a bigger commitment to the political, the social, the environmental—that’s rare,” says Amigo Bob of the latest inductees into the Sustie Hall of Fame. Look for Thomas Farm at the Ferry Plaza Farmers Market on Thursdays and Saturdays. Photos courtesy of Thomas Farm. Visit the Thomas Farm website for more vintage pics.